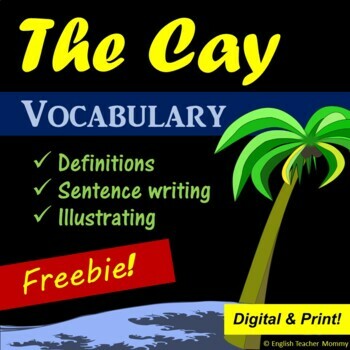 Begin your The Cay novel study by introducing 16 important vocabulary words that are used (sometimes more than once) in the book. This free resource includes two vocabulary worksheets with eight words each. Definitions and parts of speech are provided, but students are challenged to use each word in a sentence and draw a picture of something related to the word. These vocabulary activities are perfect for a class novel introduction, classwork, homework, or even test review!